The freedom as I peddled fast... as a child and as an adult, the bike has been essential to my summers (and life in general). I love the natural air-conditioning of it, the low-cost maintenance, the freedom, being with nature, riding in busy cities... with memories of riding my bike with my cousin and aunt to now taking my kids for our rides... the Bike holds such great memories in its spokes! 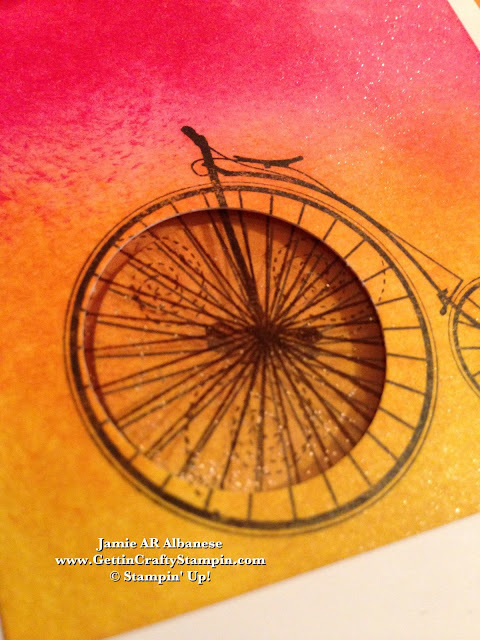 Celebrate the End of Summer when you embrace the whimsy and fun that bikes can bring to you!! 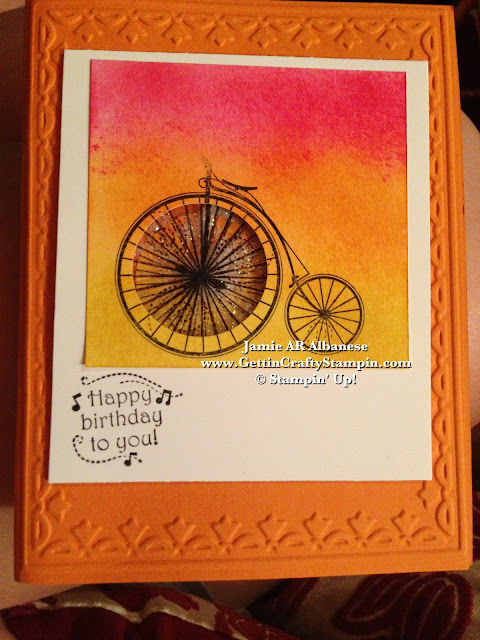 I hope you feel it with this Timeless Summer Card! 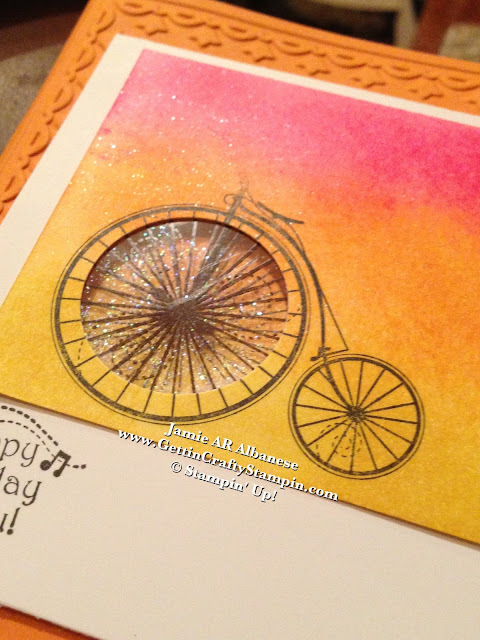 With the fun memories of bikes, old and new, are easy to capture and this colorful shaker card is sure to add some sparkle to those memories! 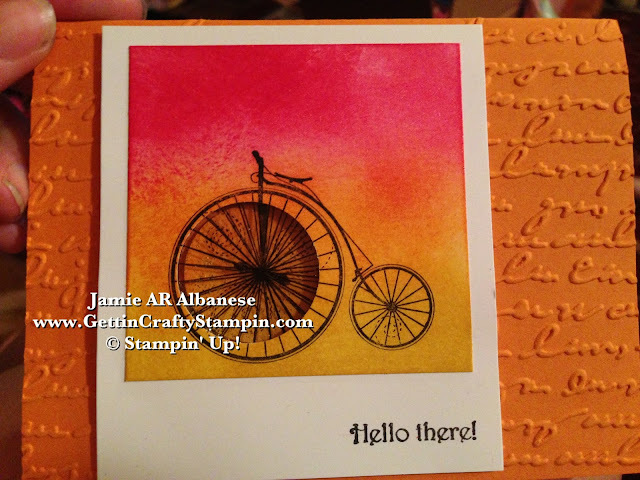 Stamping this Timeless Talk stamp set (#126607) on a Shimmery White card stock (#101910) with Stazon Jet Black ink (#101406). 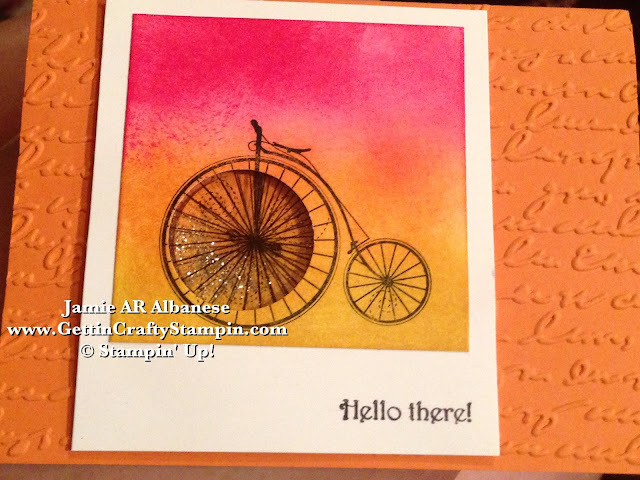 Using our Stamping Sponges (#101610) and with the help of my Color Coach (#130118) paired up Crushed Curry ink (#131173), Pumpkin Pie ink (#126945) and Melon Mambo ink (#126948). Rubbing the Crushed Curry on the bottom, build up with Pumpkin Pie and top with Melon Mambo for this sparkling sunset feel. Create this SHAKER CARD with our Shaker Frames (#124155), Window Sheets (#114323), and the aide of our 1-1/4" Circle Punch. ~ Stamp the wheel on the Window Sheet. ~ Punch out the bike center, adhere to the base of the card. ~ Add GLITTER... this post has two examples - Dazzling Diamonds (#102023) and Gold Stampin' Glitter (#132205 - Holiday Catalog pg. 29). ~ Remove Frame adhesive covering. ~ Apply Stamped Window Sheet. 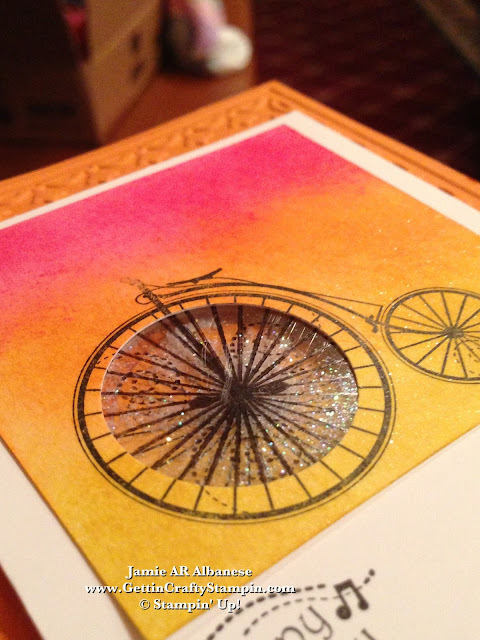 ~ Adhere the Stamped Bike above for this glittery shaker card. Here it is embossed with the Framed Tulips embossing folder and with the Dazzling Diamond glitter. The Shimmery White card stock really is a subtle but elegant touch. Create a Polaroid when you layer this stamped and sponged image over a longer piece of Whisper White card stock (#100730). Making the edges on the top and sides 1/4" and the bottom 1" so that it gives the vintage photo look. Sunset wonder, isn't it?!?! Worth of celebrating memories, birthdays, life!! 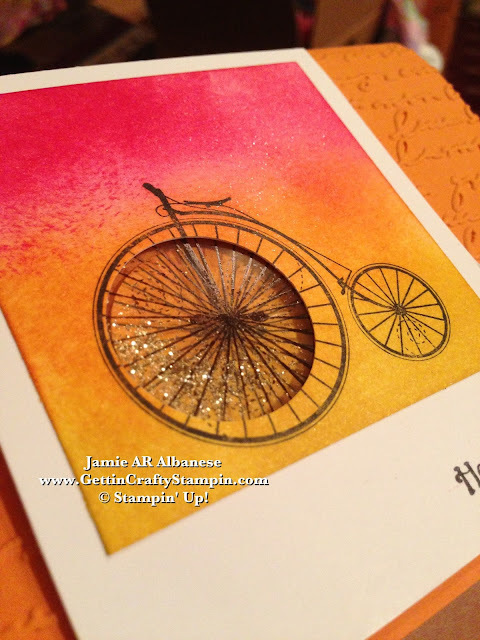 I prefer the Gold Stampin' Glitter... but oh the shaker aspect is a surprise, isn't it?? Embossed with the Pretty Print Textured Impressions Embossing Folder (#132175 Holiday catalog pg. 24) reminds me of the notes we'd write and send on post cards! Attaching a polaroid - this'd be a vintage feeling scrapbook page! 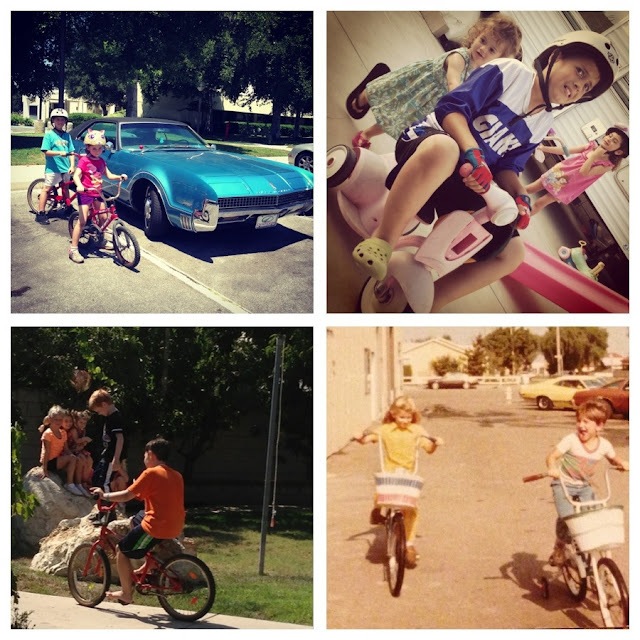 I couldn't resist a small montage of personalized biking photos... from this summer and the fun my kids had to an older photo of my brother and I riding our monkey handled Schwinn's - lol. I dig my patriotic basket and yellow jumper - bahahaha. I hope that this card brings a smile to your face! As Summer wraps up, go for it - grab a bike and take to the roads! Feel the wind in your hair and the joy of seeing life fly by with the pumping of your feet! Memories new and old roll along the wheels of life on a bike... from my Aunt D taking my cousin and I on rides on hot summer nights to chasing my brother through the neighborhoods.. now I cherish the moments my beloved children ride our neighborhoods, for frozen yogurt, to the library... Celebrate the freedom, natural eco-friendly air conditioning of the bicycle!! Happy End of Summer! I hope you've captured a few memories with your Polaroid (well, I use my Iphone and Cannon - lol - these days).